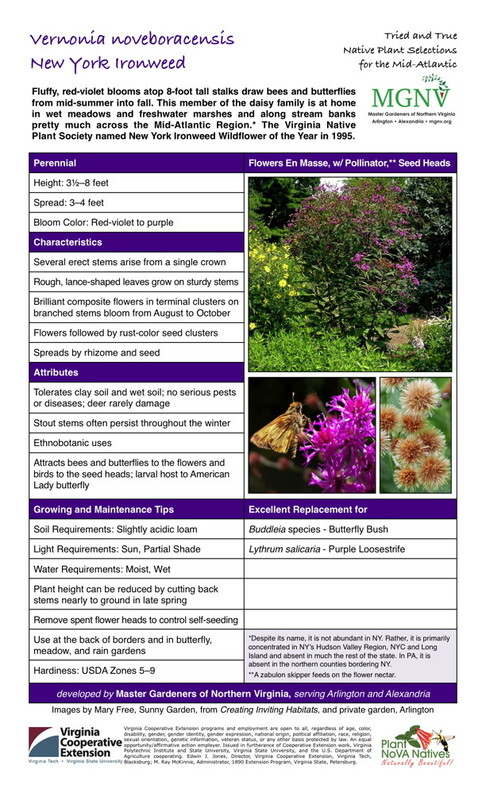 The Tried and True Native Plant Selections for the Mid-Atlantic fact sheets were originally created to support a public education program, Making Your Yard Sustainable, developed by a team of the Master Gardeners of Northern Virginia (MGNV) and first offered to the public in January/February 2013. They were later incorporated into a Digital Manual of Sustainable Gardening, used in an October 2013 MGNV program, Designing a Sustainable, Maintainable Yard. These programs were based on the Landscape for LifeTM curriculum developed by the U.S. Botanic Garden and Ladybird Johnson Wildflower Center at the University of Texas, among others. This set of nationwide teaching materials emphasizes the benefits of sustainable landscape design. In June 2013, MGNV’s sustainable landscape education program received the Search for Excellence Award in the “Community Service Category” at Master Gardener (MG) College. MG College is an annual five-day event held at Virginia Tech in Blacksburg, Virginia, that provides continuing education to certified Virginia Cooperative Extension Master Gardeners. 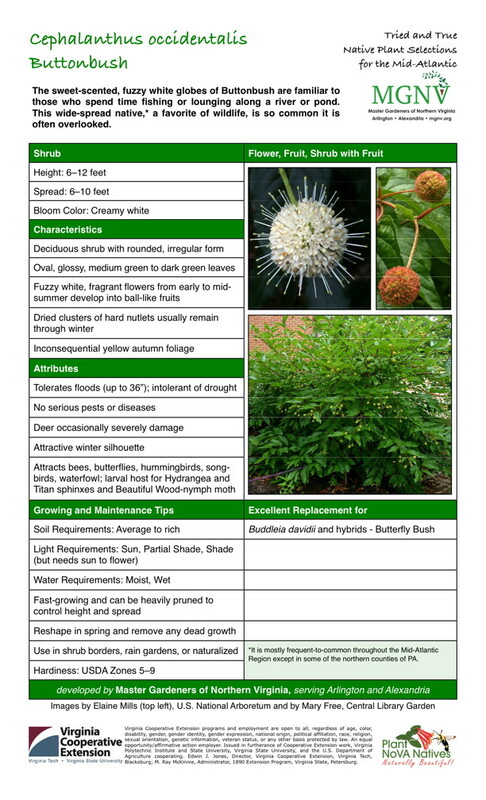 Since the initial programs, the number of native plant fact sheets has grown and along with the companion Best Bets: Plants for Particular Uses and Problem Plants and Better Alternatives have become important additions to the MGNV Web site to promote the use of native plants to a wider audience. Again, in June 2014, Master Gardeners of Northern Virginia were recognized at MG College with a Search for Excellence Award. Their work on the native plant fact sheets earned a first place in the “Innovative Projects” category. 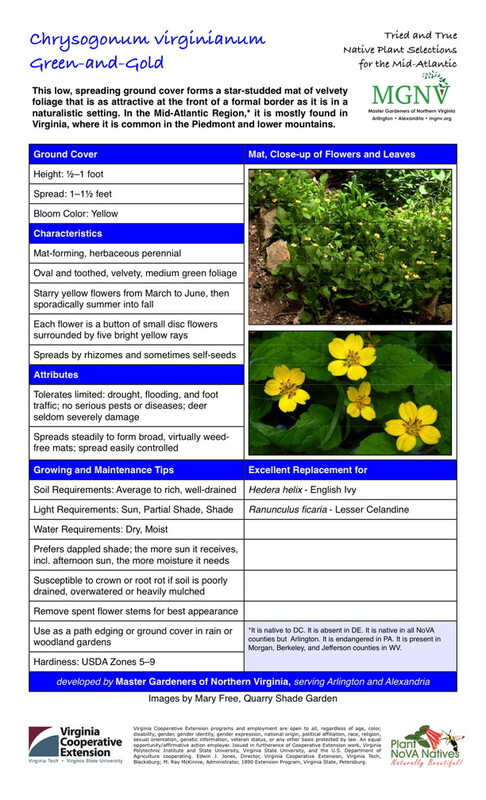 In 2015, MGNV announced the process of updating the native plant fact sheets with easier-to-read format, added information, and new images of plants that (mostly) can be visited in local public gardens. 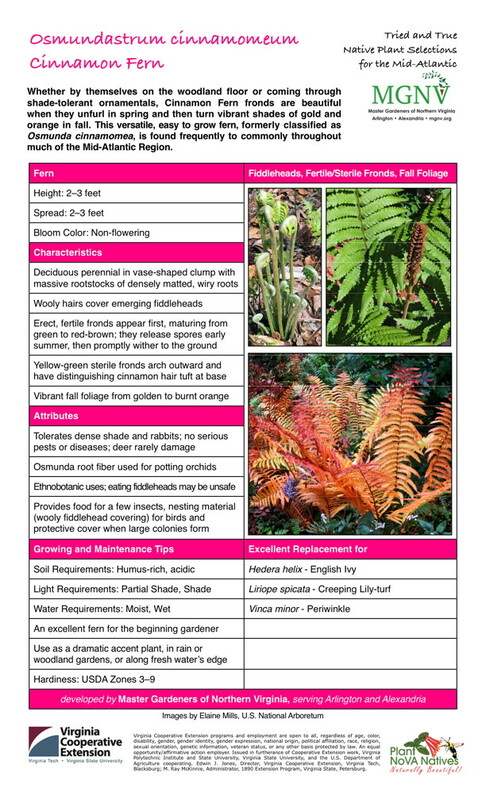 To supplement the individual plant fact sheets, a How to Use the Fact Sheets guide walks through the format line-by-line, explaining what kind of information is provided and defining many common gardening terms. The Sources and References section lists on-line materials that were invaluable in preparing the fact sheets and that you might want to visit for more detailed information. The first video promoting a plant featured in the fact sheets debuted in 2016. Videos show how the featured plants perform attracting pollinators, how insects and other wildlife interact with those plants, or how plants transition from season to season. Also in 2016, George Mason University chose MGNV for its Go Gaga for Green Organization and People’s Choice awards. The native plant fact sheets that provide homeowners with detailed information on how to incorporate native plants into the home landscape was cited as an example of successful efforts to educate the public about sustainable landscape management practices. MGNV won first place at VCE Master Gardener College for its public education efforts through digital media in June 2017. Again the native plant fact sheets, one of which is featured every week on mgnv.org, played an important role in these efforts and continued to be the top pages visited on the Web site. Calendar year 2019 began with the native plant fact sheets reformatted and updated with added information and new MGNV-generated images. Currently plans include adding a few new fact sheets to the Tried and True native plants database and a few new videos to supplement the fact sheets each year going forward.